One of the keys to meeting people is to be where people are. 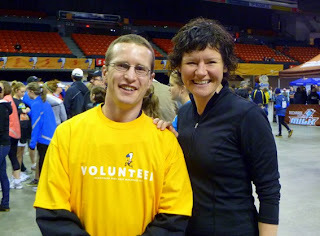 While volunteering for the Blue Nose Marathon back in May, I ran into Megan Leslie, the newly re-elected MP for Halifax. Elected in 2008, Leslie was voted Rookie MP of the Year by Maclean's Magazine in 2009, Best MP by The Coast in 2009 and 2010, "Top Up and Comer" by The Hill Times in 2010, and was named one of "the five best MPs" by The Mark News. On this day she was running to raise awareness for a charity cause dear to her (I can't remember now, but I think it had something to do with getting fresh water out to rural villages in Africa). She agreed to take a photo with me so long as I agreed to stop calling her Ms. Leslie, and start calling her Megan. You are Hank Hill to the core, Dave! We all need to get out and vote for her next election, or else they won't say she won in a land slide.